Hi guys, with all the latest hustle and bustle, we're re-grouping at home for a few days! Not being one for totally shutting down during quiet times, I'm always on the look out for interesting events locally and I've found one! 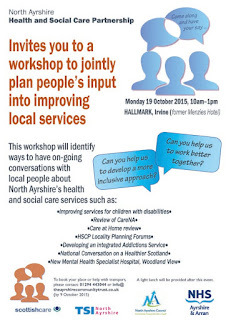 It's a workshop looking at how people can input, plan and improve local services. Our Council is pretty good on the consultation front! They've proved it with all their SDS (Self Directed Support) work and all the welcomed input from Carers while writing the Carers Strategy so when they say they're looking for local people to come along and honestly give their views on improving services, I'm happy to be involved and extend an invitation too! Six members of my Carer group, the Three Towns Carers - (plus me!) 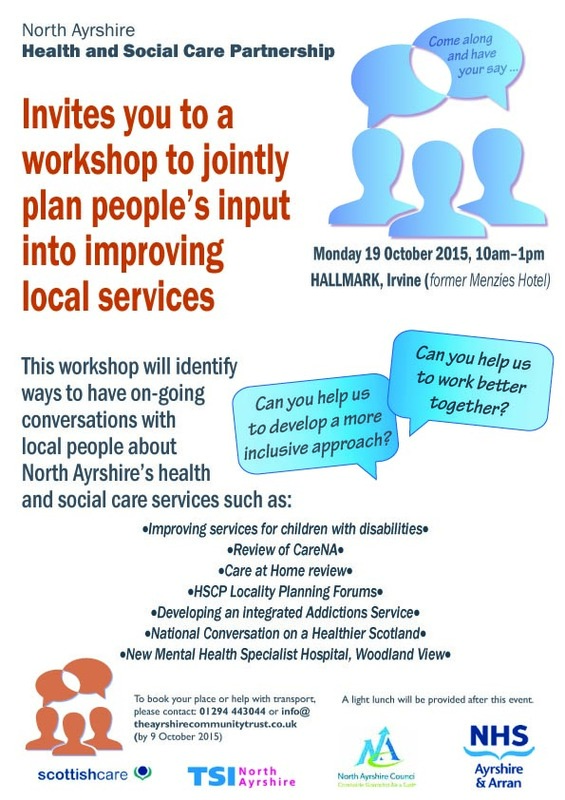 - are going along to this event on October 19th in Irvine so if you're in our neck of the woods in North Ayrshire, why not speak up and share your experience? I know I will! Hope to see you there so...get booking!